Scottsdale is a city in the state of Arizona. It is east of Phoenix and is considered to be part of the Phoenix Metro Area. Scottsdale is home to many galleries, high quality resorts, and golf courses. It is also one of the wealthier parts of the Phoenix Metro Area. High end shopping destinations are one of the primary attractions of the city. For example, the Fashion Square Mall is near downtown Scottsdale and is one of the biggest malls in the United States. The extensive galleries to the west of the downtown also offer upscale shopping and strolling. The galleries in this area display works both from local artists and from around the world. 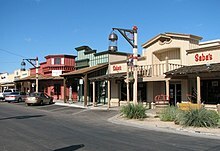 The Old Town section of Scottsdale is to the east of the gallery district . It showcases the ironic attempt of Scottsdale to both embody swank upscale style as well as a caricature of the gruff American West. This part of town is undeniably kitschy. Well over half the shops are gift shops. However, it is fun enough for a browse in a Disneyland sort of way. The valley of the sun has over 130 miles of canals . Most of them were built in the last 100 years to provide water for the irrigation of farm land. However, now that the valley is much less agrarian the canals are primarily used to carry away storm water. Some are also used to generate hydroelectric power. Be sure to try one of the 200 golf courses in the Scottsdale area. Although most of the green fees are relatively high during the high season (Nov - Apr) there are a few good courses that can be played year round at a reasonable rate. Green fees are very cheap during the summer ($10 - $50 per round with cart) and if you tee-off early in the morning the heat doesn't become too bad before you finish your round. The Phoenix metro area has several airports. The biggest and most used is the Phoenix Sky Harbor International Airport (PHX IATA) which is about a 20 minutes drive away from downtown Scottsdale. 33.622778-111.9105561 Scottsdale Airport (SCF IATA) (9 mile north of downtown, about 20 minutes from downtown Scottsdale). for smaller planes and private jets. Phoenix-Mesa Gateway Airport (AZA IATA) +1 480 988-7600  is located east of Phoenix, in neighboring Mesa. It is served mainly by Allegiant Air, although Vision Airlines also offers service. Currently, this is a smaller-sized airport, but is in the process of being redeveloped into a major regional airport. Scottsdale is undoubtedly a car-centric place. Most of the city is too spread out to reasonably walk, far more people use their own cars than ride the bus, and the light rail does not come to Scottsdale. Scottsdale is laid out for cars. The roads are large and the parking, even downtown, is usually more than ample. To keep the speed limits and traffic signals well enforced, the city of Scottsdale extensively uses photo radar. Residents often learn where the cameras are and slow down near them. However, sometimes they slow down a bit abruptly. Drivers are often well served by expecting this from time to time. There are 3 types of cameras. Intersection cameras These cameras monitor for both speeding and the running of red lights. Stationary freeway Cameras These monitor for speeding and are intended to keep the speed reasonable. They generally are triggered 11 mph over the speed limit. Mobile Van cameras These cameras monitor for speeding from the back of white vans on the side of the road. These are harder to spot because they move locations regularly and park inconspicuously. Generally it is easiest and safest to simply drive the speed limit and not run red lights. Getting around by walking can take a bit of planning. Not all roads have sidewalks and distances that seem reasonable can become quite uncomfortable in the warmer months. If you have time, messing around with something like Google's street view can be well worth it. Downtown Scottsdale, and the neighborhood south of downtown, are each served by a trolley. Both are free and usually come by every 15-20 minutes while running. The downtown trolley can be a nice way to get from the waterfront to old town or the gallery district with minimal effort. 33.606649-111.8451891 Frank Lloyd Wright's Taliesin West, 12621 N Lloyd Wright Blvd, ☎ +1 480-627-5340, e-mail: info@franklloydwright.org. June-Aug Th-M 8:30AM-3PM, Sept Sa/Th 8:30AM-5PM F 8:30AM-8PM. Frank Lloyd Wright's winter home. There's a discount on most tours for booking in advance. Tour $28-$40 (adults), $24 (students). 33.491594-111.9228812 Scottsdale Museum of Contemporary Art (SMOCA), 7374 E 2nd St, ☎ +1 480-874-4666, toll-free: +1-800-516-0811, e-mail: smoca@sccarts.org. T W Su 12PM-5PM, Th-Sa 12PM-9PM. A museum of contemporary art, architecture, and design. $7 (adults), $5 (students), free (SMOCA members, children under 15), free on Thursdays. 33.49237-111.9217243 LOVE sculpture by Robert Indiana, 3839 N Drinkwater Blvd (outside the Center for Performing Arts). This sculpture, and other versions of it, by Robert Indiana have become iconic symbols of Love. The design was originally made for a Christmas card. It has since been used in a myriad of mediums from stamps to sculpture. Other versions of this statue are in Philadelphia's Love Park, 6th Ave in New York, New Orleans, and outside the incredibly tall Taipei 101 skyscraper in Taipei, Taiwan. 33.492958-111.9235994 Scottsdale Historical Museum, 7333 E Scottsdale Mall, ☎ +1 480-945-4499, e-mail: info@scottsdalemuseum.com. Sep W-Sa 10AM-2PM, Su 12PM-4PM; Oct-May W-Sa 10AM-5PM, Su 12PM-4PM; Jun W-Sa 10AM-2PM, Su 12PM-4PM; closed Jul-Aug. Free. Scottsdale Art Walk, N Marshall Way and E Main St (Gallery District), ☎ +1 480-998-4323, e-mail: rhonda@rsvppr.com. Th 7PM-9PM. The art galleries in downtown Scottsdale have organized a walk on Thursday nights. The galleries stay open into the evening and there can be "music, munchies and more on the streets." Free. 33.566662-111.9418875 Cosanti, 6433 E Doubletree Ranch Rd, Paradise Valley, ☎ +1 480-948-6145, e-mail: email@cosanti.com. M-Sa 9AM-5PM, Su 11AM-5PM. The gallery and house of the architect Paolo Soleri. Free. 33.491694-111.9222376 Scottsdale Center for the Performing Arts, 7380 E 2nd St, ☎ +1 480-994-ARTS (2787). A theater in downtown Scottsdale that hosts concerts, dances, and other performances. 33.53746-111.9227061 McCormick-Stillman Railroad Park, 7301 E Indian Bend Rd, ☎ +1 480-312-2312. Hours depend on time of year (9 or 10AM to 5:30 or 7PM). A children's park with playgrounds and a small train that children and parents can ride around the park. Free (admission), $2 (train rides for adults). Salt River Project Canals. The banks of the canals provide nice views and an escape from cars. They are open to the public for running, biking, and other recreational activities. Motorized vehicles and swimming are prohibited. 33.545526-111.8846833 Cactus League Game (Baseball Spring Training), Salt River Fields at Talking Stick Stadium, 7555 N Pima Rd, ☎ +1 480-270-5000. 33.725625-111.9266974 MacDonald's Ranch, 26540 N Scottsdale Rd, ☎ +1 480-585-0239, e-mail: macranch@macdonaldsranch.com. Horsback riding stable. 33.534097-111.964685 Spa at Camelback Inn, 5402 E Lincoln Dr, toll-free: +1-800-922-2635, fax: +1 480-951-8469. 33.631683-111.9201086 Barrett Jackson Car Auction, 7400 E Monte Cristo Ave, ☎ +1 480-421-6694. Runs a classic car show and auction. Desert Storm Hummer Tours, toll-free: +1-866-374-8637. Since 1995, Desert Storm Hummer has specialized in Sonoran Desert adventures, including nighttime adventures. Arizona Desert Mountain Jeep Tours, toll-free: +1-800-567-3619, e-mail: Azaware@email.msn.com. Just Roughin' It Adventure Company, toll-free: +1-877-399-2477, e-mail: bunnilope@justroughinit.com. 33.502603-111.928971 Scottsdale Fashion Square, 7014 E Camelback Rd (Camelback Rd & Scottsdale Rd), ☎ +1 480-945-5495. M-Sa 10AM-9PM, Su 11AM-6PM. One of the biggest malls in the US, this is an upscale place to fill your wardrobe. It can also be fun just to wander around and see what other people are wearing. free. 33.625354-111.9251392 Eddie V's Prime Seafood, 15323 N Scottsdale Rd, #E1-160, ☎ +1 480-730-4800. Su-Th 4PM-11PM, F-Sa 4PM-12AM. The food is great, and Eddie's has something for everyone, in comparison to the meat-centrism of common steakhouses. Try the Parmesan encrusted sol. Call ahead for a reservation. Fleming's Prime Steakhouse & Wine Bar. Fleming's is known for its prime steak and elegant, cherry wood atmosphere. Its wine list features over 100 wines available by the glass. This steakhouse also offers bar menu specials until 7PM. 33.674283-111.8893423 Fleming's Prime Steakhouse & Wine Bar, 20753 North Pima Rd, ☎ +1 480-538-8000, e-mail: PDDCRanch@FlemingsSteakhouse.com. M-Th 5PM-10PM, F-Sa 5PM-10:30PM, Su 4PM-9PM. 33.530708-111.9246724 Fleming's Prime Steakhouse & Wine Bar, 6333 N Scottsdale Rd, ☎ +1 480-596-8265, e-mail: PDScottsdale@FlemingsSteakhouse.com. M-Th 5PM-10PM, F-Sa 5PM-10:30PM, Su 4PM-9PM. 33.700038-111.8896485 Mastro's Steak House, 8852 E Pinnacle Peak Rd, ☎ +1 480-585-9500. Su-Th 5PM-10PM, F-Sa 5PM-11PM; Su brunch 11AM-3PM. Mastro's also has a restaurant in Beverly Hills, with a plethora of well-known visitors that frequent it. Call ahead, as you'll most likely need a reservation. 33.493361-111.9321136 Old Town Tortilla Factory, 6910 E Main St, ☎ +1 480-945-4567, fax: +1 480-945-0815, e-mail: tortillafactory@aol.com. Su-Th 5PM-9PM, F-Sa 5PM-10PM. Modern Southwest cooking with Sonoran touches. Try the Red Chile Pork Chop, with an unlikely but tasty ancho-raspberry sauce. Patio seating, heated in winter, misted in summer. Reservations only accepted for groups of 6 or more, so prepare to wait (preferably in the adjacent tequillaria). $30. 33.454371-111.9094867 Salt Cellar Restaurant, 550 N Hayden Rd, ☎ +1 480-947-1963, fax: +1 480-941-0929. Sun-Thu 5PM-11PM, Fri & Sat 5PM-12AM. Highend Seafood in a unique, historic underground location. Kazimierz, 7137 East Stetson Dr, ☎ +1 480-WINE-004 (9463-004), fax: +1 480-WINE-055 (9463-055). nightly, 2:30PM - 2AM full menu served until 1:45AM. A great nook of a place to drink wine, eat flatbread, and decompress on kooshy couches in their dimly lit main room. The massive (over 2000) wine list is well experienced in their nicely-selected and presented three-wine flights. Add a flatbread (a fancy word for a fancy pizza) and a few friends and it's easy to lose the whole evening in a place like this. It's also easy to run up a big bill ($40-$60 per person) if you don't restrain yourself with the wine menu. $20-$30. The Boulders Resort & Golden Door Spa, 34631 N Tom Darlington Dr, PO Box 2090 (Carefree, Arizona 85377), toll-free: +1-866-397-6520. Comfort Inn, 7350 E. Gold Dust Ave (Scottsdale Road & Shea Blvd. ), ☎ +1 480-596-6559. Check-in: 3PM, check-out: 12PM. Offers guests a fitness center, an outdoor pool and a deluxe continental breakfast. $70-$200. Hilton Scottsdale Resort & Villas, 6333 N. Scottsdale Rd, ☎ +1 480 948-7750, fax: +1 480-948-2232. Check-in: 4PM, check-out: 12PM. A fairly typical Hilton hotel, though prettier than most. Quite comfortable, but housekeeping services are erratic. Good business services with $10/day wireless. $99-$120. Hotel Indigo, 4415 north civic center plaza, ☎ +1 480-941-9411. Scottsdale Plaza Resort, 7200 N Scottsdale Rd. Paradise Valley. Large resort with swimming pools, tennis courts, fitness center, racquetball. Scottsdale Resort, 7700 E. McCormick Parkway. The resort is surrounded by a 36 hole golf course, a spa and fitness center, salon services, tennis, and two pools. Resort features 326 spacious guest rooms, casitas and suites. Smoke Tree Resorts & Bungalows, 7101 East Lincoln Drive, Paradise Valley (Near the intersection of Scottsdale Rd. and Lincoln Dr.), ☎ +1 480-948-7660, fax: +1 480-948-7661, e-mail: info@smoketreeresort.com. "Restaurant REM" is at the resort itself. Families will also be pleased to know it is just a two minute drive away from the Railroad Park (a park with a small train children can ride). Westin Kierland Resort and Spa, 6902 E. Greenway Parkway, ☎ +1 480 624-1000. Beautiful property, with a great kids pool area, including a lazy river. They also have an adults-only pool area. Great service. Attached to a golf course and shopping mall. Radisson Fort McDowell Resort and Casino, 10438 North Fort McDowell Rd, ☎ +1 480 789-5300. Check-in: 4PM, check-out: 12PM. Offers amenities including free wireless Internet, fitness center, swimming pool, We-Ko-Pa Golf Club, Fort McDowell Casino, Fountain Hills Spa and Salon, and Ahnala Restaurant and Lounge. Scottsdale Marriott Suites Old Town, 7325 East 3rd Ave, ☎ +1-480-945-1550. Check-in: 4PM, check-out: 12PM. An all-suite hotel, located in the heart of Historic Old Town. Valley Ho, 6850 E. Main, ☎ +1 480 248-2000. This modern hotel exceeds expectations for accommodations and food/beverage (don't skip breakfast). Service may vary, especially during high season. This property welcomes pets and goes the extra mile to welcome man's best friend. Green grass and fountains provide a rare desert oasis for you and fido. $175.00. The Hermosa Inn, 5532 North Palo Cristi Road, Paradise Valley, toll-free: +1-800-241-1210. The Hermosa Inn is a boutique hotel featuring 34 hacienda-style, single-story casitas. JW Marriott Scottsdale Camelback Inn Resort & Spa, 5402 E. Lincoln Dr, ☎ +1 480-948-1700. JW Marriott Scottsdale Camelback Inn Resort & Spa 279. [dead link] Scottsdale Cottonwoods, 6160 North Scottsdale Rd (The Scottsdale Cottonwoods Resort & Suites is situated at 6160 N. Scottsdale Road, just 12 miles from Sky Harbor International Airport. ), ☎ +1 480-991-1414, fax: +1 480-951-3350, e-mail: reservations@scottsdalecottonwoods.com. might be closed Moderate. Fairmont Scottsdale Princess, 7575 E. Princess Dr, ☎ +1 602-585-4848. Hotel/spa with multiple pools, fishing, golf, tennis, The area that surrounds it is also very nice, in close proximity to Mastro's and Eddie V's restaurants. $200-400. The Phoenician, 6000 East Camelback Rd, toll-free: +1-866-716-8136. Upscale resort with a 27-hole championship course. Nine pools, tennis courts, spa. Resort Suites, 7677 E. Princess Blvd, toll-free: +1-888-222-1059. Suites with full living and dining areas, private patios, kitchen and free wifi. Four swimming pools, three whirlpools, a fitness center, and a business center. Talking Stick Resort, 9800 East Indian Bend Rd, toll-free: +1-866-877-9897. Phone=" Upscale resort with a casino, day spa, with a multiple restaurants. 33.694673-111.7326383 McDowell Mountain Regional Park, 16300 McDowell Mountain Park Dr, ☎ +1 480-471-0173, fax: +1 602-372-8507, e-mail: mcdowellpark@mail.maricopa.gov. Check-in: 1PM, check-out: 12PM. Has more than 70 sites for tents or RVs, water and partial hookups, flush toilets and hot showers available. Reservations can be made online ($8). $10/tents, $25/RVs. It doesn't rain very frequently in Scottsdale. However, when the rain does come many lakes swell, bike paths are submerged, and roads become impassable. If there is a notable amount of water on the road, don't drive through it. Drivers frequently become stranded in the middle of flooded washes. Cars can be swept away in a deceptively small amount of water. As you might guess, attempting to drive across such flooded roads is dangerous. Arizona also has what they like to call a "Stupid Motorist Law." It says that if someone drives around a barricade to enter a flooded road they will be charged for their rescue. In the summer it can get quite hot. Dehydration, heat stroke, and sun stroke become notable risks. Drink plenty of water and stay indoors in the afternoon, during the hottest parts of the day. Outdoor activities are usually far more pleasant in the early morning when it is still cool. Because the temperatures in the desert swing so much between night and day, morning temperatures can be quite pleasant even during the height of the summer. This city travel guide to Scottsdale is a usable article. It has information on how to get there and on restaurants and hotels. An adventurous person could use this article, but please feel free to improve it by editing the page.